Basseterre, St. Kitts — Thirty-five budding young readers from the various primary schools on the island of St. Kitts are at the Charles A. Halbert Public Library in Basseterre taking part in the annual Easter Read-A-Thon which this year has received support from the Development Bank of St. Kitts and Nevis. According to the coordinator of the event, Assistant Librarian Mrs Carmen Browne, the primary school participants reported on Monday April 7 where they had prominent Kittitian author, Mr Loughlin Tatem, and retired educator Mrs Dorothy Martin as presenters. “Mr Loughlin Tatem, who has recently released a poetry book talked to the children and he encouraged them to read,” said Mrs Browne. “He dwelt on the importance of reading, and told them what encouraged him to write. He actually motivated them and he had them engaged in book activities. Presenter on Tuesday was Ms Constance Richardson, a retired educationist who spoke to the participants about poetry and even read some poems to them. When the children started reading their own poems, Ms Richardson guided them on how to use gestures when delivering the poem. The event is expected to come to an end on Thursday April 17, and according to Mrs Browne, two of the past winners from the Easter Read-A-Thon, Mr Ivor Carr who won in 1996, and Mr Akeem Bacchus who won in 2001, will be special guests at the closing ceremony where awards will be given to the winners. 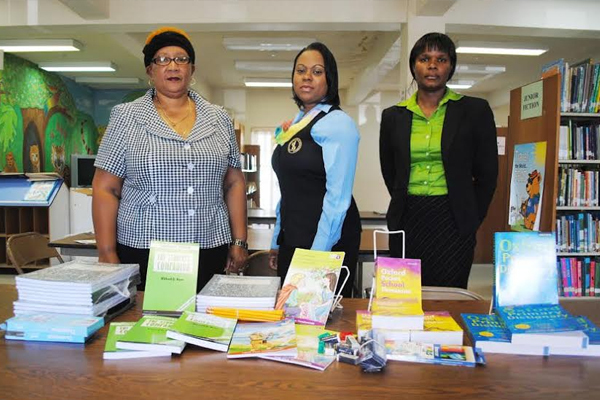 The Library had earlier approached the Development Bank of St. Kitts and Nevis with the request that it sponsors the event by donating some of the items that will be given as prizes to the winners. Their request was honoured and the prize items were presented by Ms Danienne Brin, the bank’s Manager for Human Resources, Marketing and Product Development. “I have never sent a letter to the Development Bank before,” explained Mrs Browne. “I did and you were the first to call and responded and said that you are going to sponsor the programme, and I was very excited to know that. She informed Ms Brin that the Easter Read-A-Thon is one of the library’s outreach programmes, which has been held for the past seventeen years for children ages 7-12. The children are encouraged to read as many books as possible, after which they are asked questions from each of the books and the person who would have read the most books and answers the most questions is designated the winner. Past winners include Makini Byron 1995, Ivor Carr 1996, Rozna Rogers 1997, Charlene Otto 1998, Melissa Bryant 1999 (as a junior) and 2000 (as a senior), Akeem Bacchus 2001, Karla Liburd 2002, Britany Osborne 2003, Hardai Baley-Pitt 2004, Nichiel Huggins 2010, Abion Stevens 2011, and Jodi-Lyn A. Watson 2013. Ms Danienne Brin congratulated the library saying that it helps children to realise how important reading is because these days everything is technology based and so much digitised and it takes children’s attention from the written word. Librarian, Ms Carrolyn Henry, who was present when the donation was made, explained that for the winner there is a trophy. Donations received from well wishers are given to the other winners in the two categories, and with the donation from the Development Bank, everyone will get a prize this year.